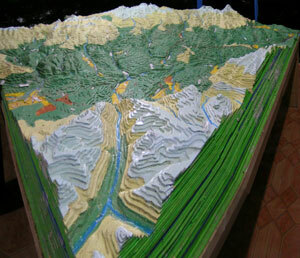 This 1:25,000-scale model Participatory 3-D Model of Surkhang Village Development Committee and its adjoining area (Kali Gandaki Watershed of Annapurna Conservation Area was completed in year 2004. The unique characteristics of Trans Himalayan biodiversity has added more glory to Upper Mustang. Due to the deteriorating pasturelands, the project has initiated various experiments so as to preserve the biodiversity in perpetuity. The conservation knowledge to everyone is a must in each and every aspect of conservation initiative. It is also necessary to aware people about their own region by applying various modern approaches and it also helps in better planning the conservation and management activities. By considering these facts, as a new and more informative process, i.e. P3DM was deployed with technical assistance provided by ICIMOD. Model produced in the framework of the Rangeland Management Programme of King Mahendra Trust for Nature Conservation, the Annapurna Conservation Area Project and the Upper Mustang Biodiversity Conservation Project with technical assistance from ICIMOD.